Every fisherman knows that you are only as good as the gear you carry. The same goes for your day out on the water. This includes your boat, your rod, your tackle and your nets. Seasoned, fisherman don’t waste time and money at a store buying bait. They know that fresh bait is the best tool you can have to catch the best fish. That is where cast nets come in. Cast nets are thrown into the water where schools of small bait fish congregate in order to scoop up the best and freshest bait. This is then used for your day of fishing to attract bigger predator fish to your area. The best cast nets are those that are small enough to still capture your bait fish but also big enough to sink below the water at a fast enough rate to catch them quickly. When planning your next day out on the water, having the best bait cast net will ensure that you reach the most success. To help make this process easier we have found the best cast nets on today’s market. We have also gone into a bit of detail about what to look for when buying your next net. On top of that, we answered some common questions to help increase your success on the water and make you a better fisherman. Betts has made a great cast net for beginners. It comes in two sizes and features a diameter of line that has been designed for weight and strength. ⅜ inch diameter line is great for any size fish while maintaining a lightweight feel. As you may know, it can take repeated throws to get your catch and this set won’t cause a huge strain on your body. What makes this package stand out is it comes with instructions, store hooks and even lures. This will make getting started even easier. 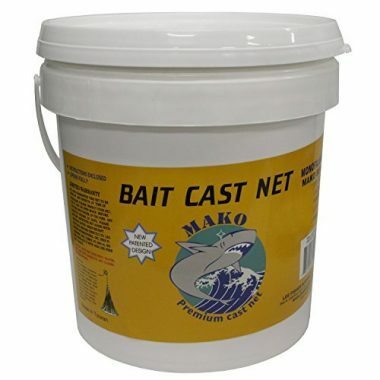 If you are tired of having to buy all your bait, this is the best cast net to learn on. 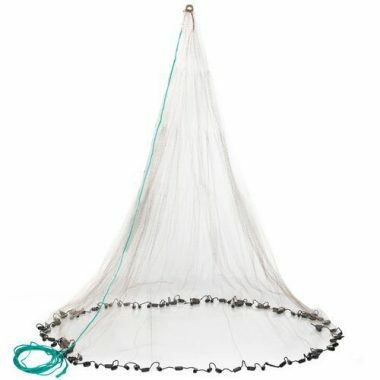 This cast net comes in 6 different sizes ranging from 3 feet to 8 feet making it especially versatile. You’ll be able to choose the exact right size for your need. Every size net is made from 80 lbs test braille lines making it super durable. 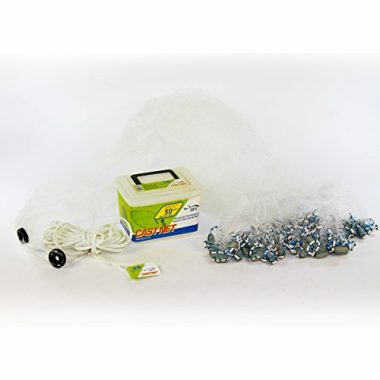 This net includes chip resistant vinyl coated steel weights. In fact, there’s ¾ lbs of weight every foot along the edge of this net. You’ll also have a 24 foot handline with a heavy duty anodized swivel. This makes reeling in the net, hopefully with your catch, as easy as possible. You won’t have an issue storing this option as it comes with a reusable hard plastic container. It has been designed to fit the net perfectly while taking up the least amount of space. Noa Store has made a top quality cast net. It has a handmade copolymer monofilament mesh with a ⅜ inch rating. 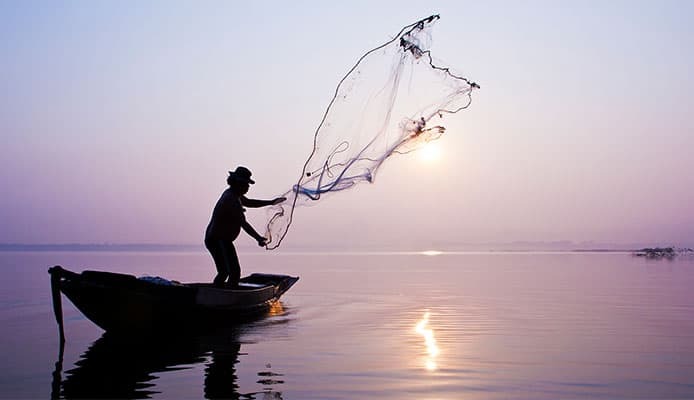 This means you’ll be able to catch any sized fish without straining the net. What stands out about this net is the heavy duty environmentally friendly sinkers. This company has made a quality product while being environmentally conscious. Also, they have one of the longest hand lines, that even floats. The Saltwater Fishing Cast Net is handmade and has been woven from treated tire threads. This makes it exceptionally durable and won’t tear if you catch it on something. Once you get it out of the package you’ll be able to see the superior quality of this set. It has pure lead weights which get this cast net to the bottom quicker so you don’t lose your catch. The mesh has smaller spacing so you’ll also be able to catch smaller fish. Also, the net has been designed for you to easily throw it. No longer will you have to struggle to find bait. This nylon cast net is one of the heaviest duty on the market. Its line is rated at 100 lbs and is made from top of the line test braille. 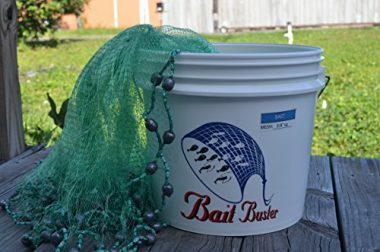 Bait Buster also knows the importance of the weight per foot, which is why they included 1.5 lbs per foot around the radius of this net. This will make the net sink much faster meaning you’ll have a better chance of catching fish. This may be one of the best cast nets on the market. It has one of the longest hand lines coming in at 32 feet. The net itself has been handmade from copolymer monofilament and has a ¼ inch spacing. There is also a 2 inch anodized swivel which reduces tangles and makes it even easier to reel in. It has also been designed to lie flatter and easier to throw. You’ll find a throwing aid belt and detailed instructions if you are new to using a cast net. Even if you’re a novice you’ll be throwing perfect casts in no time. 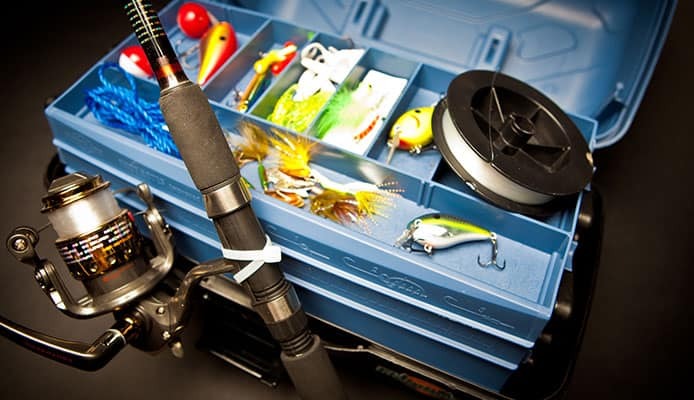 Fitec is one of the largest companies that make commercial fishing equipment in the USA. This means they have the resources to research, design, and manufacture the highest quality products possible. This cast net has been designed to maintain a wide spread even after you throw it meaning you’ll have a higher chance of scooping your catch. The net itself is made from a nylon material making it lightweight and durable. You’ll be able to use this net many times in a day without wearing out your body or the net itself. Lee Fisher has made a cast net that will allow you to catch bait fish ranging from 3 to 6 inches long. This means you’ll be able to catch a wide variety of fish allowing you to tailor it to your ideal catch. Its hand line is nearly 50 feet long so you can be prepared no matter how far you can throw it. The weights are 1 pound per foot which allows it to sink quickly but being light enough for you to easily throw as many times as you need. 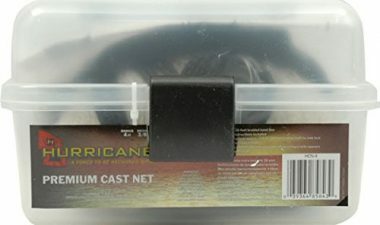 This cast net by Hurricane is a great option for rivers and shallow waters. It is made from a monofilament braille material found on many cast nets on the market. 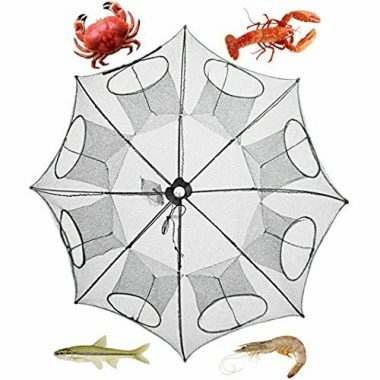 There is a reason why this is one of the top rated cast nets on the market. It can also be used in freshwater or saltwater situations making it quite versatile. You won’t need to get different styles of nets in order to get the bait you need. Not only does this net come in 7 different sizes, the line varies in diameter. This makes the net retain its strength as the size increases. For the a to be able to catch the largest fish possible it has to have the strength to stand up the weight. A wider diameter line is much stronger than simply increasing the width while the line remains the same diameter. This cast net also has a higher amount of weight per foot than normal. The 1.5 of lead attached to the end of the net ensures your catch stays inside the net. These weights are attached to high quality monofilament which has been designed to stand up to the rigors of any conditions you throw at it, literally. You’ll find this net feels softer than you’re used to, something your hands will appreciate. 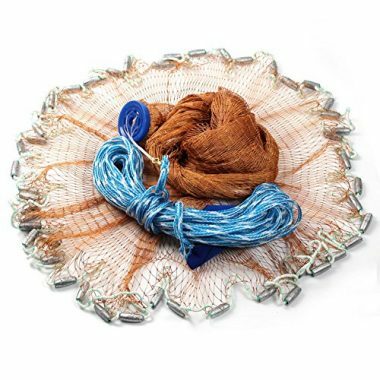 When you are looking for your next fishing cast net, there are many different things to keep in mind. Most fisherman will agree that the bait that you have will make or break your success out on the water. Fresh live bait will deliver the best results in catching larger fish. 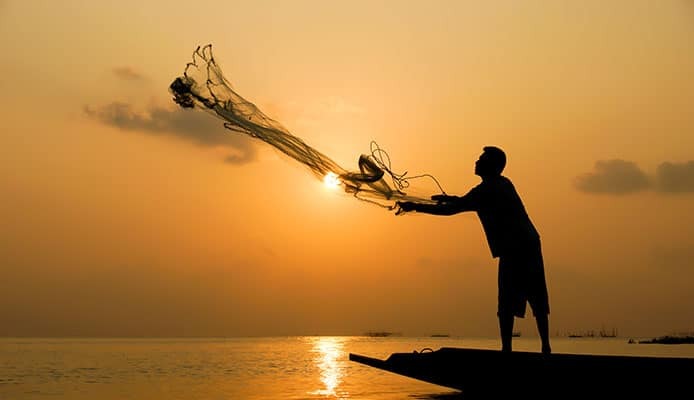 While you may think it is as simple as throwing any ordinary net into the water, in reality, there is some thought that needs to be put into it. Without the right net and proper knowledge of how to use a net, you could end up throwing your net right over a school of baitfish and not catching a single one. To help you avoid this, and to navigate the many cast net types on the market, we have put together a guide that will help you choose the ideal cast net for your fishing needs. The size of net you choose will depend first and foremost on your experience with the sport. Beginners will want to go with a net no bigger than 8 feet. In most cases, the size of the net is measured in terms of its radius when opened. Other times it is measured by how tall it is when held up. Most experienced net throwers will find themselves most comfortable with a 10 foot net. Professionals that are well seasoned will tend to go with the bigger 12 foot net but this is simply not used or needed for most fisherman. Of course, experience level is not the only factor to consider when choosing your net size. If you are throwing off a large deep sea fishing boat you will require a larger net than if you are throwing off a small kayak or normal kayak. If you are taking to smaller vessels you will want a smaller net, around the 6 foot range. Once you have decided on an ideal size for your next fishing net, it is important to pay attention to the mesh size you will need. Mesh size refers to the size of the weave in your net or the holes seen in them. When you are catching small bait fish you will need a smaller weave size so that the fish can not simply swim out once caught in your net. The mesh size you will need depends on two main factors: how deep you plan to cast your net and the size of bait you are looking to catch. Luckily, smaller bait tends to stay in shallower waters while bigger fish tend to live in slightly deeper waters. This allows the two factors to be closely related that you will not have to give this as much thought. If you are looking to cast into shallow waters of less than 3 feet, a mesh size of ¼” will be ideal. Here you will be able to successfully catch bait such as shrimp and minnows. This type of casting can be done from the beach and does not require a boat of any kind. You will want to keep in mind that the smaller the mesh size, the slower your net will sink below the water’s surface. 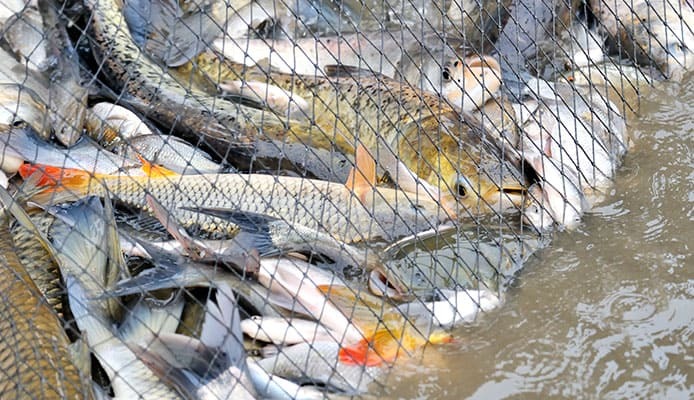 For this reason, a mesh size of ¼” will sink at a slower rate than a ½” mesh net. Because of this you will not find success casting a ¼” net into 6 feet of water. This is because it will sink to the bottom at too slow of a rate to effectively be able to catch any fish. If you find yourself in water between 3 to 6 feet in depth you will have more success going with a mesh size of ⅜”. With this mesh size, you can effectively catch greenbacks, scaled sardines, herring and pilchards. This mesh size is a very popular choice because of its range. You are able to catch in shallower waters while also being able to go down to more depth effectively. It is important to consider that the net size you use in the summer will likely not be the same as you do in colder months. During wintertime, you will find that fish will go into a bit deeper water in order to keep temperate. This is why mesh of ⅜” size is so popular. When fish explore deeper water in colder months, this net is able to go down fast enough to still be useful. 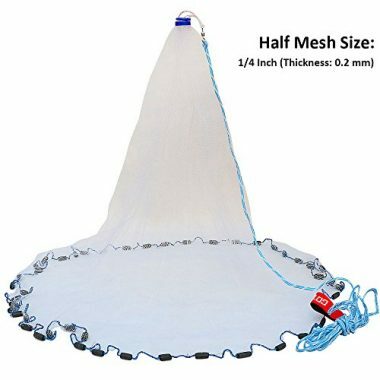 A far less popular size is going with a mesh net size of ½”. At this size, you can effectively cast into water between 6 to 15 feet deep. 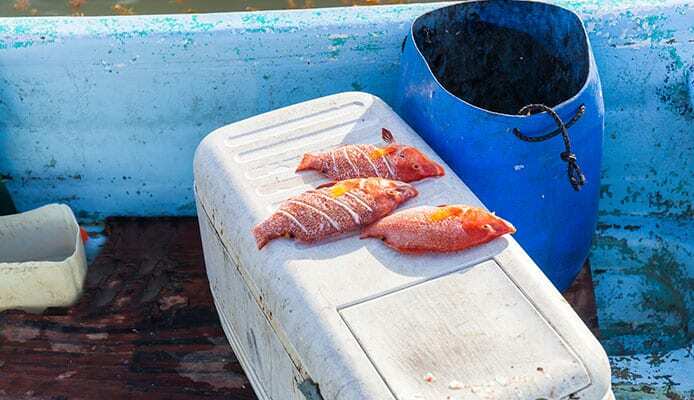 While you will be able to catch a larger size of fish at this depth, you also risk catching small fish that will try to swim out of the net getting their gills caught. Here you will be left with a bit of a mess that isn’t as productive as you might hope. If you find yourself targeting large bait such as Mullet, you will want a mesh size between ⅝” and 1”. Here you will be able to quickly cast to a depth of between 8 to 12 feet deep. While you still may face problems with gilling some bait you will be able to quickly and effectively sink your net at a rate fast enough to make your catch. As mentioned previously, you will want to pay close attention to the size and type of the bait you intend to catch. If you are looking to catch mullet you will require a much larger mesh size than if you are looking to catch shrimp. While this plays a role in your mesh size, it also plays a direct role in your net size. Fish that are smaller and stay in shallower waters will require both a net size and a mesh size that is smaller than bigger bait. The net weight refers to the amount of weight that is added to the perimeter of the net to help it sink at a faster rate. The most common net weights you will come across is 0.75 pounds, 1 pound and 1.5 pounds per radius foot. 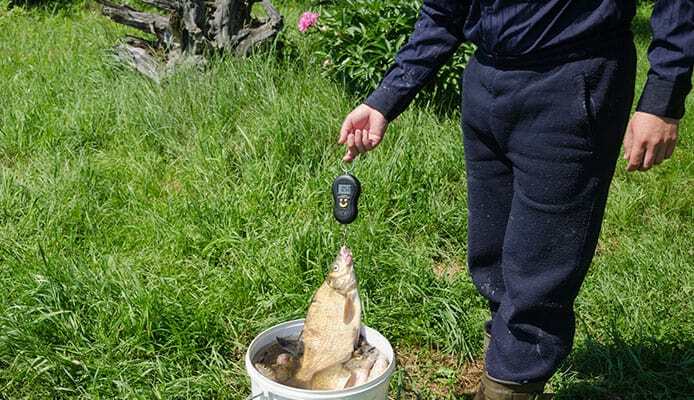 So a 6 foot net equipped with 1 pound per foot will have a gross weight of between 8-9 pounds including actual net weight. While you may think that a heavier weight is always a better choice, it depends solely on the depth of water you plan to throw into. In most cases, a heavier net will be a better option as it will sink faster. On the negative, a heavier net will require a lot more effort to successfully throw into the water. In shallow water, a heavier net will require more effort and not necessarily produce that much of a greater result. Finding a weight that balances effort and depth is ideal. There are many different methods used for effectively throwing a bait catching net. We recommend trying a few different methods to gain a good grasp of the sport and finding a method that works best for you. While there are many online tutorials that you can gain access to, the best method is to partner with someone who has experience and allowing them to teach you. Many cast nets will come with instructions and some even have tutorial videos that will help you gain the knowledge necessary for success. Q: What Is Mesh And Why Is It Important? A: The mesh is the woven part of the net. The size of the mesh will determine the size of fish you’re going to catch. A wider spacing of the mesh will obviously allow smaller fish to escape the net. You should determine the size of the fish you’re trying to catch before purchasing your net. Also, if you’re planning on fishing in different environments, like the ocean or rivers, you may need a differently sized net. A: As with all your fishing gear it is wise to rinse it off after use. This is specifically important in saltwater conditions as it causes a lot more wear and tear to your products. Rinsing your cast net helps to protect the water you go into by clearing off any microbes that have attached themselves to your gear. This works to protect the delicate ecosystems in different bodies of water. The best way to clean off your cast net is by giving it a thorough rinse using freshwater. Simply hosing off your net before hanging to dry after every use will go a long way into maintaining your net. Q: Where Do I Store My Cast Net When I Don’t Use It? 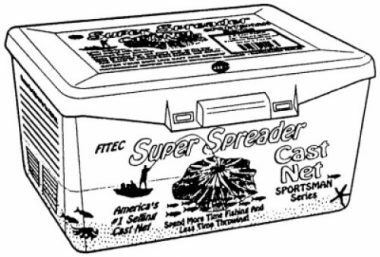 A: Once your net is completely dry you will want to store it in a safe area. Finding a spot indoors in a cool environment away from direct sunlight will prove to be the best for your net. When looking for your next top rated bait cast net, we recommend you equip yourself with as much knowledge before making your purchase. Knowing what to look for in your next cast net will allow you to get the most from your money and make it so that you get the best net for your fishing needs. Once you know the proper size you are looking for it is simply a matter of choosing a net that meets all your specifications. 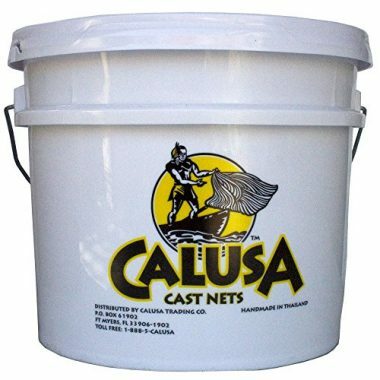 Be sure to always look into the different cast net reviews available on the product to get a good idea of the nets quality. Have you ever tried fishing with one of the cast nets on our list? Let us know how it transformed your experience in the comment section below.